The above statement is taken from a new paper that has just come out of the University of Michigan. The paper titled “Latency Arbitrage, Market Fragmentation, and Efficiency: A Two-Market Model” was written by Elaine Wah and Michael Wellman. One interesting note is that these two researchers are not from the business school but rather they hail from Computer Science and Engineering department. Also interesting is that this paper was supported from grants from the National Science Foundation. Based on those facts alone, this paper earns immediate respect from us as opposed to the pro-HFT puff piece that recently came out of Columbia Business School that was sponsored by Citadel. The paper studies the effects of what is known as latency arbitrage. 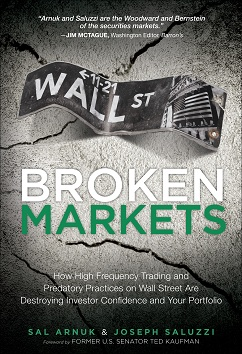 Long time readers of Themis Thoughts of course are very familiar with this term and probably recall a white paper that we wrote back in December 2009 titled Latency Arbitrage: The Real Power Behind Predatory High Frequency Trading . One of the favorite defenses of the pro-HFT crowd, which includes some regulators, is that they have not seen any data that proves HFT is harmful. Of course they haven’t, because they make it very difficult and expensive for researchers to access the raw data. This University of Michigan paper is similar to the recent Chicago Fed paper because they both offer new innovative solutions to the current market structure problems. We encourage our regulators to stop trying to defend the Rube Goldberg machine stock market that they helped to create and start trying to experiment with innovative solutions like this paper has proposed.